When you think about it, many of us spent our childhoods dreaming of growing up and wearing khaki. Specifically, the beige pocket-covered vests, wide-brimmed hats, and high ankle boots worn by iconic paleontologists – the trail-blazing adventurers who unearth the remnants of our prehistoric past. It’s hard to stand in a museum underneath a colossal dinosaur skeleton without imagining what it would be like, rock chisel and fossil brush in hand, to uncover something buried millions of years ago. Fortunately for Bloomington’s amateur and professional paleontologists alike, Lake Monroe is fossiliferous (paleontology jargon for “chock-full of fossils”). No PhD or khaki necessary; to observe fossils all you have to do is watch where you step. While the Amy Weingartner Branigin Peninsula Preserve now hosts a tiered forest of thick upland hardwoods, the land was once submerged under a shallow ocean covered by a reef-like crinoid forest. Crinoids, (Elegantocrinus hemisphaericus) are the ancient ancestors of sea lilies, star fish, sea cucumbers, sea urchins, and other Echniodermata. They looked almost like the end of a tassel or a mop head, anchored in place to the seafloor by a long stalk. 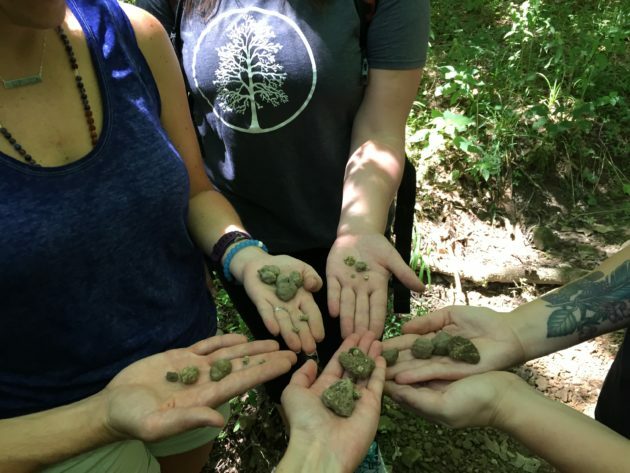 While modern descendants are now found in the deepest oceans, fragments from ancient crinoids lay inconspicuously along the shore of Lake Monroe. To the untrained eye, the disklike fossils easily blend into the mix of pebbles and sand, but once spotted it’s hard to believe how many ancient relics have always been just underfoot. Though rare today, crinoid bioherms, the sea-lily equivalent of a coral reef, dominated the area during the Mississippian period, spanning from 340-350 million years ago. To provide some context, dinosaurs (though they never set claw in Indiana), lived about 100 million years later. The prehistoric reef rested upon the Borden Group rocks, an outcropping of siltstone, sandstone, shale, and limestone that stretches across Indiana like a diagonal stripe from the Ohio River in Harrison County northwestward to Benton County. The water that deposited most of the Borden Group rocks flowed from the newly formed Appalachian Mountains. The limestone, however, was not deposited by these ancient waters. Instead, this sedimentary rock was formed largely from the remains of shelled organisms that were cemented together through a combination of time and pressure. Not only is limestone made from the remains of organisms like corals and mollusks with calciumcarbonate shells, but it is also a great preserver of fossils. It’s no wonder then that southern Indiana, known for its abundant limestone, would also become known for its wealth of crinoid skeletons. Over 80 species of crinoids were discovered at Allens Creek, just four miles southwest of the Peninsula Preserve. Though many of us look upwards while winding along the trail to spot bald eagles and red-shouldered hawks, you should cast your gaze downward when you head to the shoreline. You are likely to see many of the crinoid stem discs (columnals) while you enjoy the cool breeze off the lake. While you’re looking down, you may spot brachiopod and byozoan fossils and geodes, in addition of course to some of the more modern creatures that now inhabit the area. Crinoid fossils have provided paleontologists insight into the paleoecology of ecosystems long since altered by combinations of extinctions and evolution. They also give every discerning hiker an opportunity to peek into that prehistoric world. We think about the land as a shared resource – something to be protected because of its current or future ecological value. There is also a value in protecting these places because of their ability to inform us about the past. While the land above the shoreline is protected by Sycamore (and the shoreline by the Indiana DNR), the fossils are protected in two ways. First, fossil hunting on state property is prohibited. But even without this legal barrier, many hikers also believe that the best way to enjoy the natural world sustainably is to leave no trace, even as we enjoy the traces left by ancient animals like crinoids. Leave No Trace is a movement that encourages hikers to leave what they find in the same way they found them and to take out whatever they bring into the forest, in addition to being wary about the introduction of nonnative species and respecting wildlife. Through this kind of ethic, we not only encourage the preservation of our current environment, but also of our natural heritage.